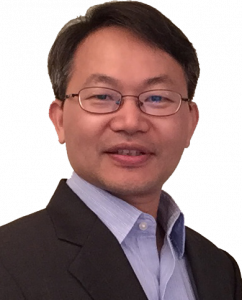 Dr. Wang grew up in a small village in southeastern China, but decided to pursue a career in chemistry while at high school reading an article by Richard E. Smalley. He later became one of Smalley’s last graduate students, completing his Ph.D. at Rice University with the support of a 4-year Presidential Fellowship. At Rice, Dr. Wang demonstrated the feasibility of “cloning” single-walled carbon nanotubes and also contributed to the development of the first conductive rival of Kevlar from carbon nanotubes. He did his postdoctoral study with Chad A. Mirkin at Northwestern University, where he co-invented massively parallel molecular printing and, along with George C. Schatz, developed a fundamental understanding of the directed assembly and manipulation of nanostructures through patterned molecular templates. 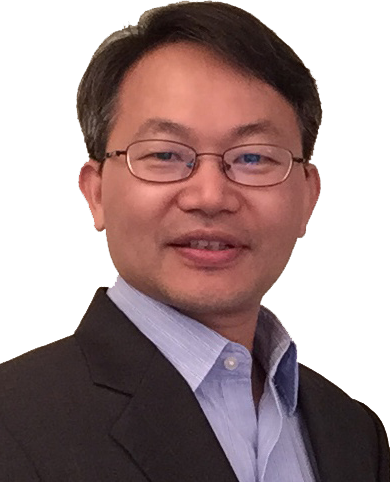 Since starting at the University of Maryland in the fall of 2008, Dr. Wang and his research group have initiated ambitious new research directions. Two of these directions have turned into exciting new frontiers, including: 1) Molecularly Tunable Fluorescent Quantum Defects (or Organic Color-Centers); and 2) Tube^2: tube-in-a-tube semiconductors. Both quantum defects and Tube^2 are new classes of functional nanomaterials synthetically created in Dr. Wang’s laboratory. These novel quantum systems allow his group and a quickly growing community to probe, both experimentally and theoretically, a series of fundamental new phenomena that arise from these versatile synthetic structures. Extending from the fundamentals to applications, they are also exploiting these new properties and chemistries for electrical energy storage, thermoacoustics, biomedical imaging/sensing, as well as energy-saving and quantum technologies. Particularly, his research group has recently made breakthroughs in developing methodologies/technologies to enable single defect spectroscopy in the shortwave infrared, quantitative infrared measurements, and dynamic gating of infrared radiation in a textile that allows for adaptive self-regulating thermal radiation and heat exchange through the fabric. Associate Professor (with Tenure), Department of Chemistry and Biochemistry, The University of Maryland, 8/2014 – 7/2017. Assistant Professor, Department of Chemistry and Biochemistry, The University of Maryland, 8/2008–7/2014. Affiliated faulty member, University of Maryland Materials Science and Engineering Department, 2018-present. Faculty member, University of Maryland Energy Research Center, 12/2014-present. Faculty member, Chemical Physics Program, University of Maryland, 12/2008–present. Faculty member, Maryland NanoCenter, 8/2008–present. Postdoctoral associate, Northwestern University, 2005–2008 (advisor: Prof. Chad A. Mirkin). Project Leader, Carbon Nanotechnology Laboratory, Rice University, 2001–2004. Symposium Co-Organizer, “At the Interface Between Molecules and Materials.” The American Physical Society March Meeting, March 2-6, 2015. San Antonio, TX. (w/ George C. Schatz, Emily Weiss). Symposium Organizer, “Symposium on Energy Material.” May 16, 2014. College Park, Maryland. Vice-Chair of Organizing Committee, “7th Sino-US Forum on Nanoscience and Nanotechnology (中美华人纳米论坛).” June 8-11, 2012. Xiamen, China. Symposium Organizer. “Chemistry of Carbon Nanomaterials,” the Middle Atlantic Regional Meeting of the American Chemical Society, May 21-24, 2011. Symposium Organizer. “Chemical Methods of Nanofabrication,” 237th ACS National Meeting, March 22-26, 2009. This three-day symposium featured 25 invited talks under the Salt Lake City meeting theme, “Nanoscience: Challenges for the Future.” (co-organizers: Chad Mirkin, So-Jung Park); read editorial comments by Paul Weiss and Penelope Lewis at ACS Nano. Regularly reviewed for Nature journals, JACS, ACS Nano, Journal of Physical Chemistry, Nano Letters, PNAS, Advanced Materials, Angew. Chem., Small, and a few others. ACS National Meeting, ANYL Symposium “Advances in Wearable & Implantable Sensors.” San Diego, CA. August 25-29, 2019. ACS National Meeting, International Symposium on “Chemistry and Utilization of Agro-Based Materials.” San Diego, CA. August 25-29, 2019. 10th Symposium on Carbon Nanomaterials Biology, Medicine & Toxicology. July 21-26, 2019. Wuerzburg, Germany. NT19: International Conference on the Science and Application of Nanotubes and Low-Dimensional Materials. July 21-26, 2019. Wuerzburg, Germany. Symposium on Printed and Flexible Electronics, TechConnect World Innovation, June 17-19, 2019. Boston, MA. “Wearable Technology, Materials and Applications II” Workshop, IPRIME Annual Meeting, University of Minnesota, May 29, 2019. Symposium “Carbon Nanotubes – From Fundamentals to Devices.” The 235th Electrochemical Society Meeting, May 26-31, 2019. Dallas, Texas. Boston College, Department of Chemistry, March 11, 2019. US Army Natick/CCC-Soldier Center, March 11, 2019. Army Science Planning and Strategy Meeting (ASPSM) on “Chemo-structural Dynamics.” January 23, 2019. Rice University, Houston, Texas. 2018 iMatSci Innovator Showcase. Materials Research Society Fall Meeting and Exhibit, Boston, MA. November 27-28, 2018. “Carbon Nanotubes and Graphene Research” Symposium, ACS Southwest Regional Meeting (SWRM), Nov. 7-10, 2018. Little Rock, Arkansas. Huazhong University of Science and Technology, July 13, 2018. WONTON 2018 – 7th Workshop on Nanotube Optics and Nanospectroscopy. July 8-12, 2018. Hakone, Japan. Kyushu University, Nanotechnology Platform Seminar Series. July 6, 2018. Xiamen University, Department of Chemistry, June 27, 2018. ESP2018: 8th Conference on “Excited State Processes in Electronic and Bio Nanomaterials” June 4-7, 2018. Santa Fe, New Mexico. Symposium “Carbon Nanotubes – From Fundamentals to Devices.” The 233rd Electrochemical Society Meeting, May 13-17, 2018. Seattle, Washington. International Conference and Expo on Nanotechnology.” April 19-21, 2018. Dubai, UAE. Workshop on “Hybrid Photonic-Plasmonic Materials: Toward Ultimate Control Over the Generation and Fate of Photons,” The Center for Nonlinear Studies, Los Alamos National Laboratory, March 1-2, 2018.
International Symposium on nano surface/interface and cluster chemistry in energy materials. December 14-17, 2017. Xiamen University, Xiamen, China. Rutgers University, LSM/IAMDN Seminar. November 9, 2017. Stony Brook University, Biomedical Engineering Seminar Series, October 25, 2017. 10th Low-Dimensional Nanoscale Electronic and Photonic Devices Symposium, The 232th Electrochemical Society Meeting, October 1-6, 2017. National Harbor, MD. Telluride Workshop on Nanomaterials: Computation, Theory, and Experiment, July 11-15, 2017. Telluride, CO.
Telluride Workshop on the Defect Chemistry and Physics of Low-dimensional Materials, July 11-15, 2017. Telluride, CO. Symposium “Carbon Nanotubes – From Fundamentals to Devices” The 231th Electrochemical Society Meeting, May 28-June 2, 2017. New Orleans, LA. The Engineering Sustainability Workshop, University of Maryland, April 25, 2017. Nanotechnology and Nanosciences Session, Nanoworld Conference, April 3-5, 2017. Boston, MA. Army Research Laboratory, July 28, 2016. Xiamen University, July 15, 2016. 23rd International Workshop on Active -Matrix Flatpanel Displays and Devices, July 6-8, 2016. Kyoto, Japan. University of Tokyo, July 5, 2016. B03 Symposium “Carbon Nanotubes – From Fundamentals to Devices” The 229th Electrochemical Society Meeting, May 29-June 3, 2016. San Diego, CA. Memorial Sloan-Kettering Cancer Center, New York. January 8, 2016. E2S Energy Summit, the 228th Electrochemical Society Meeting, October 11-16, 2015. Phoenix, AZ. Symposium on Solid-State Electronics and Photonics in Biology and Medicine, the 228th Electrochemical Society Meeting, October 11-16, 2015. Phoenix, AZ. Milliken Research, South Carolina. September 25, 2015. 4th Emerging Information and Technology Association Young Investigator Forum: Leadership, Innovation, and Growth. August 6-7, 2015. MIT, Cambridge, MA. Telluride Workshop on Nanomaterials: Computation, Theory, and Experiment, June 29 – July 3, 2015. Telluride, CO.
Energy Materials and Nanotechnology Qingdao Meeting. June 14-17, 2015. Qingdao, China. Carbon Nanotubes – From Fundamentals to Devices Symposium, the 227th Electrochemical Society Meeting, May 24-28, 2015. Chicago, IL. NIST, Semiconductor and Dimensional Metrology Division, March 17, 2015. APS National Meeting, Focus Session: At the Interface between Molecules and Materials, March 2-6, 2015. San Antonio, Texas. Carbon Nanotubes – From Fundamentals to Devices Symposium, the 225th Electrochemical Society Meeting, Orlando, FL. May 11-16, 2014. Defense Threat Reduction Agency, CB Tech Watch Platform Seminar, November 13, 2013. Symposium on Cluster Sciences in Honor of Professor Lan-sun Zheng, Xiamen University, October 22, 2013. Xiamen, China. Carnegie Mellon University, Department of Chemistry, November 7, 2013. University of Colorado, Boulder, Department of Chemistry and Biochemistry, September 30, 2013. Department of Energy Energy Frontier Research Center Principal Investigators’ Meeting, July 18-19, 2013. Washington, DC. Telluride Workshop on the Chemistry and Physics of Defects in Carbon Nanotubes, July 8-12, 2013. Telluride, CO. The 8th Sino-US symposium on Nanoscale Science and Technology, June 28-30, 2013. Zhejiang University, Hangzhou, China. Tsinghua University, Department of Chemistry Colloquium, June 27, 2013. Peking University, Department of Chemistry, Nanochemistry Forum, June 26, 2013. 1st International Symposium on Nanocarbons, June 16-21, 2013. Hefei, China (keynote speaker). UC Davis, Department of Chemistry. May 7, 2013. UC Santa Cruz, Department of Chemistry and Biochemistry. May 6, 2013. Membrane Technology Research, Inc. May 1, 2013. Stanford University, Department of Chemistry, Physical Chemistry Seminar, April 29, 2013. Army Research Laboratory, Aberdeen Proving Ground, April 26, 2013. North Carolina State University, Department of Materials Science and Engineering, April 19, 2013. University of North Carolina at Chapel Hill, Department of Chemistry, April 18, 2013. Duke University, Department of Chemistry, April 16, 2013. Rice University, Department of Chemistry, March 26, 2013. MIT, Department of Chemical Engineering, March 15, 2013. Boston College, Department of Chemistry, March 14, 2013. University of Pittsburgh, Department of Chemistry, March 7, 2013. Rutgers, Department of Chemistry Colloquium, March 5, 2013. University of Pennsylvania, Department of Chemistry, October 2, 2012. University of Central Florida, Department of Chemistry, April 19, 2012. The 7th Sino-US symposium on Nanoscale Science and Technology, June 8-11, 2012. Xiamen, China. Villa Conference on Energy Materials Nanotechnology, April 16-20, 2012. Orlando, Florida, United States. University of Florida, Department of Chemistry, Analytical Division Seminar, April 11, 2012. Nano-2012: International Conference & Exhibition on Nanotechnology & Nanomedicine, March 12-14, 2012. Omaha, United States. Army Research Laboratory, Adelphi, MD. February 17, 2012. Seoul National University, Department of Physics, Korea. January 19, 2012. The 3rd KAIST-UMD Symposium on Emerging Physical and Bio-Science, Jan 15 – 18, 2012. KAIST, Korea. International Semiconductor Device Research Symposium, December 7-9, 2011. College Park, MD, United States. 242nd ACS National Meeting & Exposition, Nanomanufacturing for Energy Symposium, August 28-September 1, 2011. Denver, Colorado. Xiamen University, College of Chemistry and Chemical Engineering, China. August 5, 2011. Carbon 2011: Annual International World Conference on Carbon, July 24-29, 2011. Shanghai, China. “Double-Walled Carbon Nanotubes: Challenges and Opportunities.” (keynote speaker). Shanghai Institute of Organic Chemistry, Chinese Academy of Sciences. July 27, 2011. University of Science and Technology of China, Hefei, China. July 22, 2011. Howard University, Department of Chemistry Colloquium, March 4, 2011. Central Michigan University, Department of Chemistry Colloquium, October 4, 2010. Nanotech 2010 Conference and Expo, June 21-25, 2010 (Anaheim, CA). The ARL Fellows Symposium, “Nanomaterials: Science & Engineering.” Oct 8, 2009 (Aberdeen, Maryland, United States). NIST, Biochemical Science Division, September 8, 2009. 5th International Conference on Materials for Advanced Technologies, 28 June – 3rd July, 2009 (Singapore). Nanotech 2009 Conference and Expo, May 3-7, 2009 (Houston, TX). 237th ACS National Meeting, March 22-26, 2009 (Salt Lake City, Utah).